A few days after coming back from Tennessee, I was still immersed in this touching championship. I did not expect that the track was so hard, so I thought I would cry when arriving at the finish line. But when I sprinted wearing the national flag of China, I forgot these dark hours before. the championship, I am proud of myself who tries my best and challenges self. Of course, luck is another factor for my success. I arrived in Chattanooga near noon of local time, and registered at the stadium. The scene was filled with ardor and passion, coupled with Tennessee River shining in the light, brought away my fatigue caused by long-distance flight and jet lag. After listening to the Championship Technical Meeting, I participated in a traditional event — Athlete Parade. Athletes from various countries passed through alleys holding their national flags. The audience at the roadside and upstairs would give out the largest cheers when every athlete passed by. “China!! China!! Ni Hao!” These words still rang in my ears. After the parade, athletes entered the stadium near the finish line in order. And Athlete Welcome Conference was kicked off. In nearly an hour, the world’s most dynamic people were excited and happy, which also made the audience touched. I packed up the equipment, and went to the stadium. I stored the package and parked the car there. The stadium played the restless music at the maximum volume, making people feel the passion before the start of the World Championship. In the face of something unknown in the upcoming game, I was uneasy. At that time, I understood that the most powerful heart can solve problems if there are some, rather than ensure that there is no problem. I am often touched by excited and firm eyes of athletes. And I hope that others can see calmness and firmness in my eyes. Finally, the championship was kicked off. After having breakfast at 5 am, I put on the clothes designed for the game, stick on the race number, and set out with my equipment. My car played restless music, making me full of spirits before the daybreak. At 7:30 am, semi-professional group started off; and various age groups set out in order. Our group was the last but one, starting off around 8:50 am. Accompanied by the whistle and the voice of “Go” in my heart, I jumped into the water in the sunshine. The difficulty of the track, as well as the scenery along the way and cheering from the audience, must be unforgettable memories for every player. 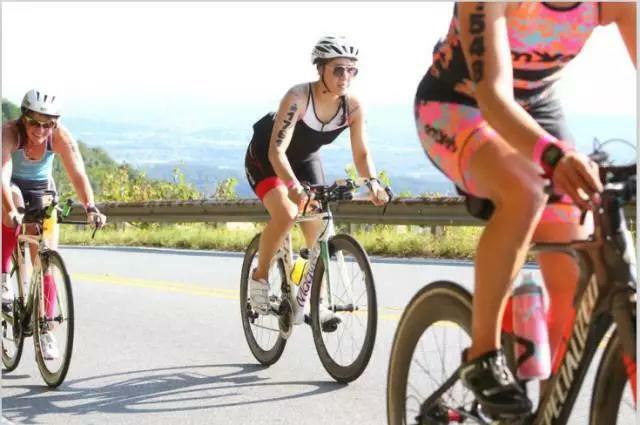 In terms of swimming, more than half of the journey is countercurrent; in terms of riding, the first 35K was more than 1000 meters above sea level, namely climbing the mountain along the hillside road; in terms of running, the maximum height was more than 300 meters above sea level; a round of running, namely 10K, covered four bridges. Due to the difficulty of the track, I spent nearly seven hours completing the championship. 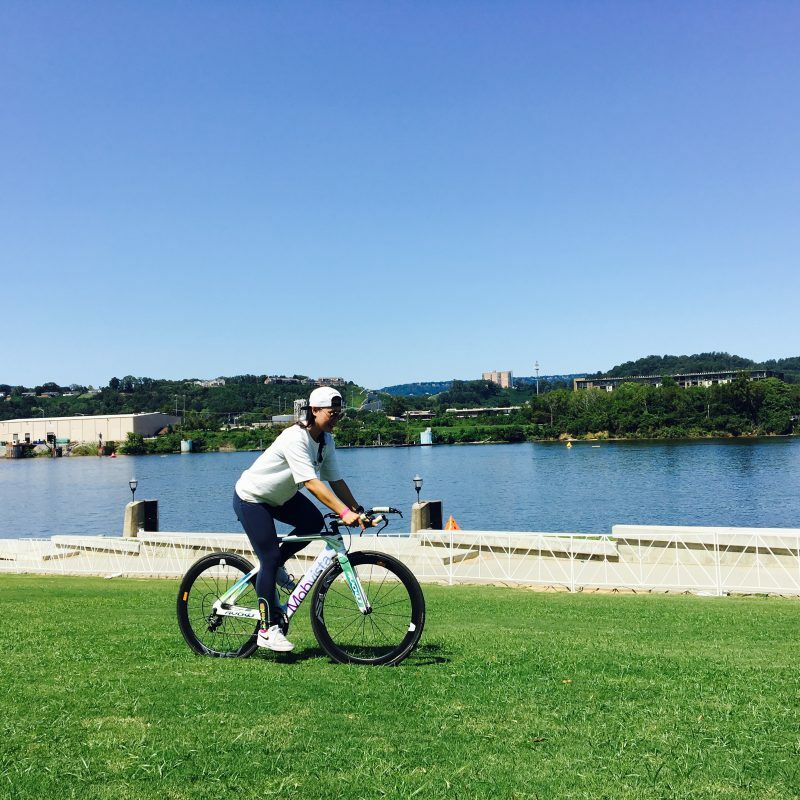 At the beginning of cycling, I encountered a huge slope which seemed insurmountable to me. But I rode up with cheering from the audience on both sides. My heart rate soared to 200 then, showing how ardent the atmosphere was! You will certainly enjoy the great atmosphere when participating in sports competitions in the United States. The audience on both sides will shout out your name on the number card and cheer for you. 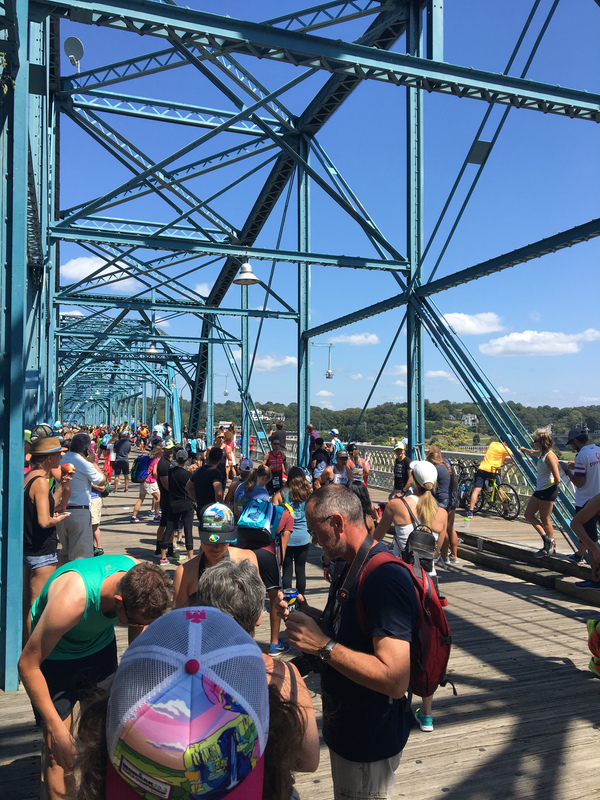 The last bridge was full of people who cheered for every player passing by. The encouragement on this day can even cheer you up for the whole year. Near the finish line, I took the flag from my friend and rushed all the way to the line. 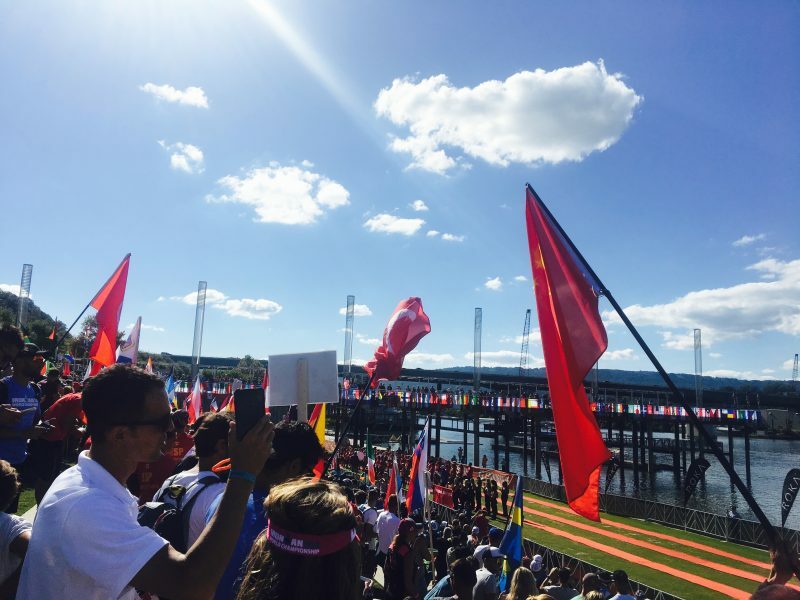 Accompanied by cheers on both sides, I wrapped myself in Chinese flags when rushing to the finish line. At that moment, sense of achievement overshadowed difficulty in the past few hours and hard work in the past few months. 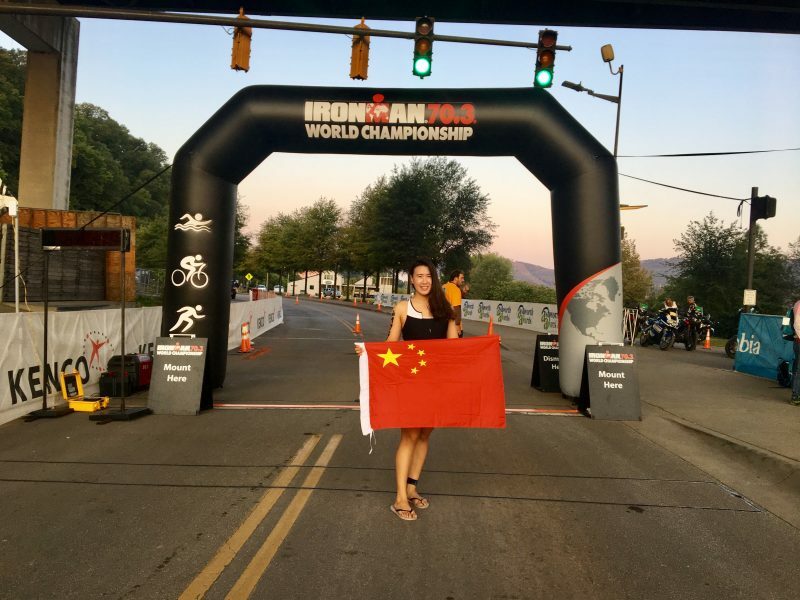 Although my final score was not so satisfactory, I became another Chinese player who finished 2017 ironman 70.3 World Championship (18-to- 24-year- old age group for women). 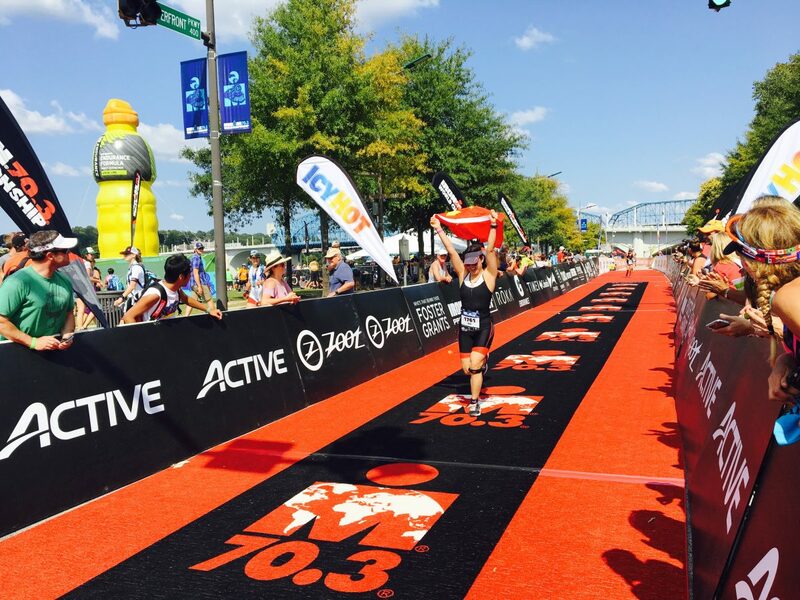 Since then, I have had a new identity – ironman 70.3 World Championship Finisher. Being one of the audience rather than the contestant, I watched an amazing world-class competition for men. I was excited at men players’ spirit of competition; I was worried about grey-hair old men; and I cheered for the players. In particular, I was impressed by two moments. 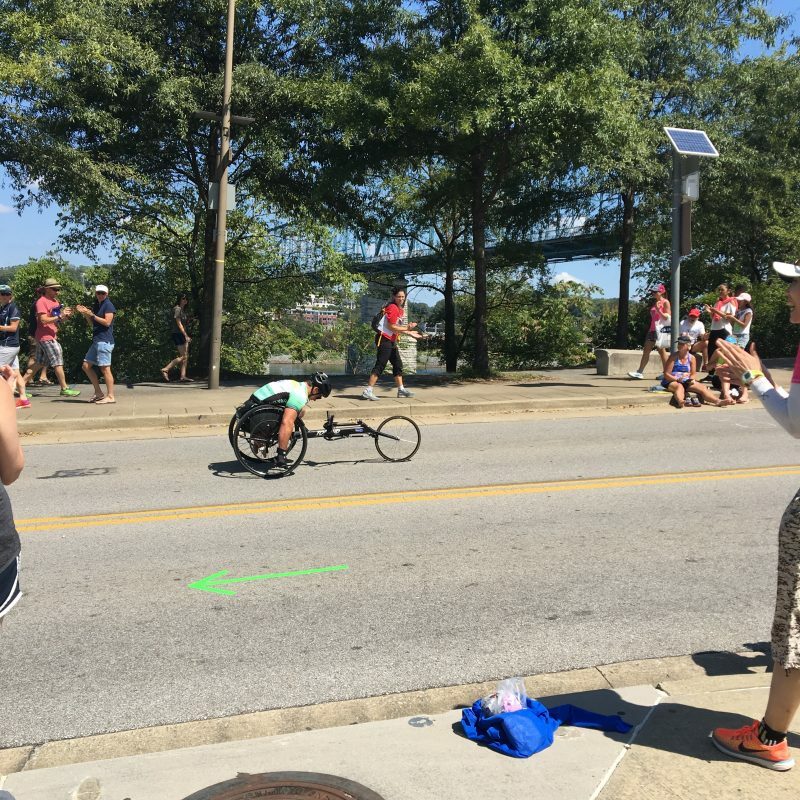 The first one is: a physically challenged athlete with a handwheel machine tried his best to march on when passing by a long uphill. The vein of his whole arms stood out, and the audience cheered for him until the end of the uphill. I was touched by his hard work and encouragement. The second one is at the finish line. Because of falling down in cycling, the left side of a player, from the waist to the thighs, was bruised. 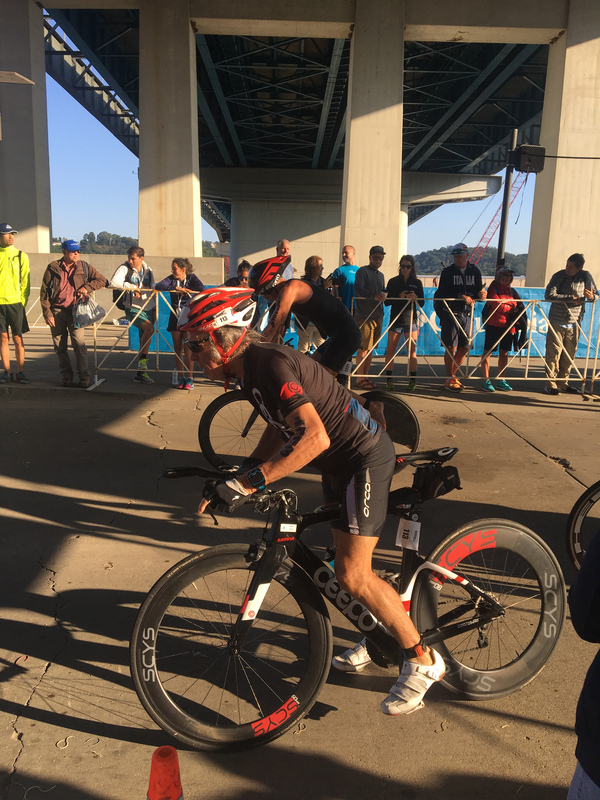 But he was still very excited at his completion, and said to his families: “It’s super tough, but super beautiful!” According to his number card, I checked his age group — 45-to- 49-year- old age group. This was a very interesting part of the sports: although the track is tough and makes players exhausted, nobody will ignore its beauty. These most dynamic players are also the most optimistic and positive. A friend of mine who was the player of triathlon said: “In fact, survival is quite simple. You only need to repeat a day for 365 times. 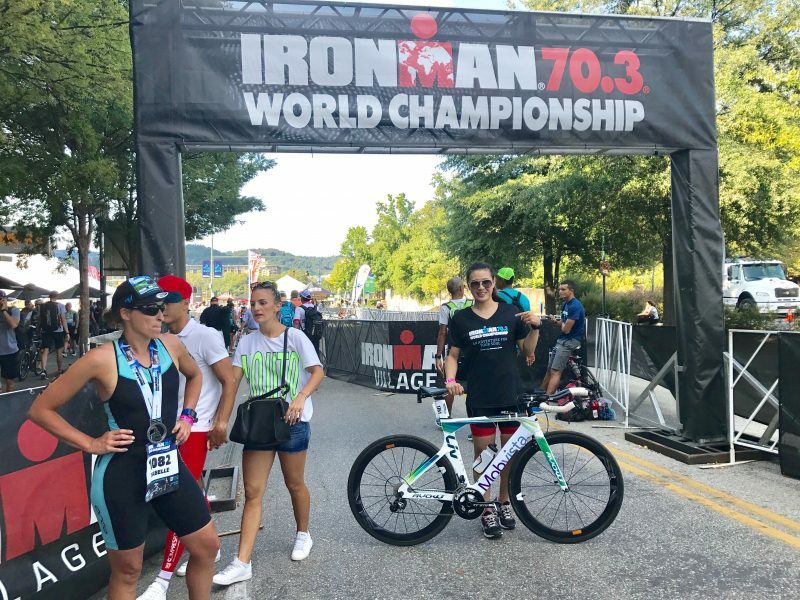 But life is more than living, and needs more interesting things.” And triathlon gives him a sense of ritual for life, hope for the future, a clear direction for struggle, and a motive to keep moving forward. The sport makes him see everything in life with the solemn attitude and understand the extraordinary significance of perseverance to life. Do it yourself; go and explore; go over and over again to surpass self-righteous self; and challenge more impossibilities. As time flies, you will have no motive if there is no goal. And if you only set goals within your own comfort zone, you will miss too many possibilities. These seemingly incredible attempts make you do something impossible again and again. 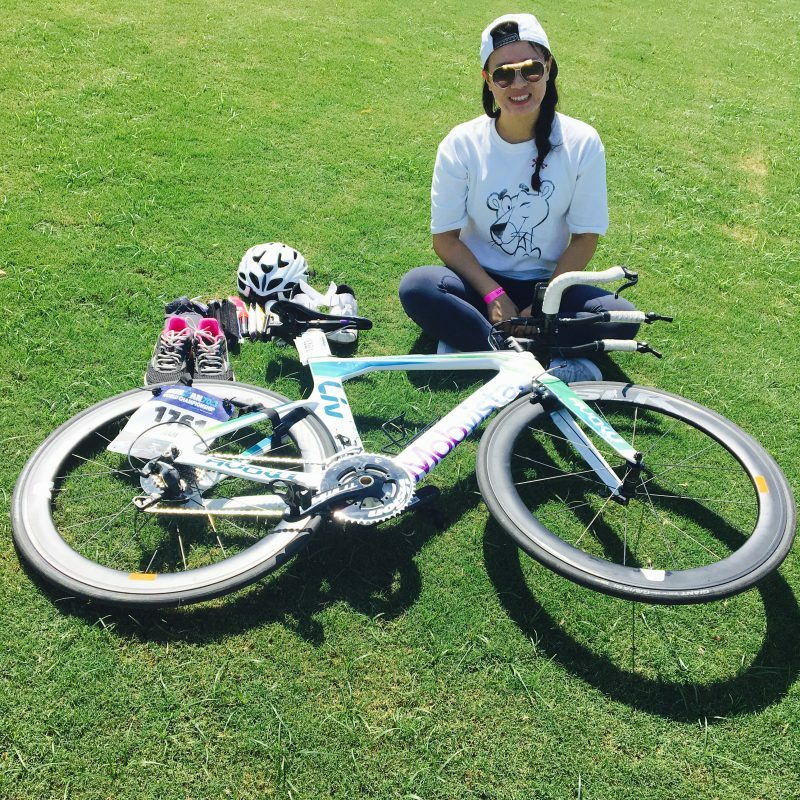 At the end of November last year, I completed my first triathlon game; within less than a year, I could complete the World Championship. For people like me who worked for only more than a year, luck is a factor for the success. Besides, I receive much support, including encouragement and support from my company. At the same time, I try my best to adjust the pace of life and faithfully implement training plan. All of these seem boring and lonely to others, but I am touched by the period of time when looking back. In fact, the society is full of resources and possibilities. Despite twists and turns, anything you render valuable will pay you back, as long as you work hard and adhere to it. After all, we are young; why not try it? I want to share IRONMAN’s slogan with you–“Anything is possible”. I hope that I can meet any of you at the game you’re interested in, after I complete another large-scale triathlon game next year.